After you have uploaded your price list, you will be redirected to the General settings page. Enter the general information about your store. Configure your delivery options and points of sale. You already provided some of this information at the time of registration. Specify the other data about your store. Specify your store's site. Maximum address length: 50 characters. Cyrillic links are permitted. This field is mandatory for users that plan to publish product offers using the “Click-to-Shop” model. 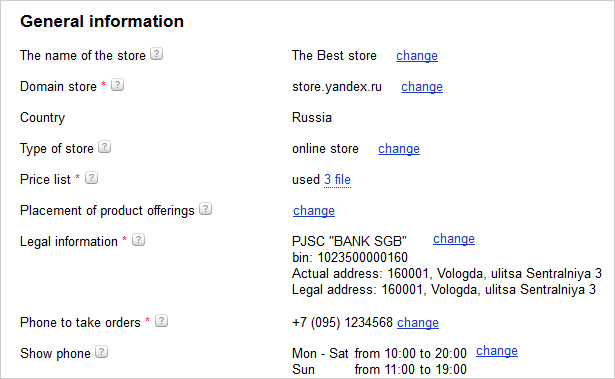 You can set the times when your offers are displayed on Yandex.Market: around the clock or according to a schedule. Specify legal information about your company. You must specify it in accordance with the Federal Law “On Advertising” FZ-38 dated 3/13/2006, and it will be published on Yandex.Market. In addition, this information should be listed on your site. Enter the link to this page in the URL field. Note. Only stores that are residents of Russia need to fill in this information. Specify the phone number for your store (or your call center) that customers can use to place orders. Configure the schedule of hours during which your store or call center answers the phone. Attention. Your call center schedule should be specified according to the UTC +03:00 time zone. For a detailed description of these settings, please see the section Placement settings. Specify the city where your store is located, and specify the delivery terms for your region. Specify the other regions that you are willing to ship products to: your offers will be shown to users in these regions. For more information, see the Delivery and Customer Pickup section. Configure the business hours for your delivery or courier service. For more detailed information, see the instructions. Create order pickup locations and retail store locations if your store allows customers to pick up their orders. Your points of sale will be shown on the Yandex.Market map. For more information, see the instructions for Self Pickup and Points of Sale.